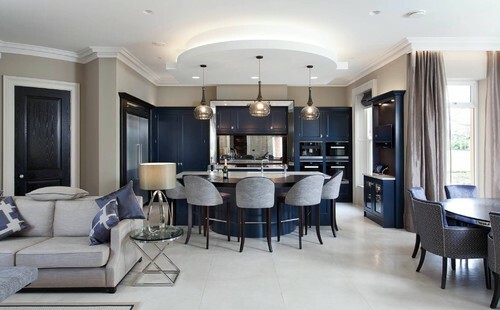 A great way to add this color to your design is to have a navy blue island. In particular, Sherwin Williams’ Naval Blue is quite a popular choice. Surrounded by a sea of white, a navy colored island can be quite the statement piece. If you are looking to incorporate navy cabinets into an open space, consider matching accessories – such as pillows and upholstered dining chairs. Doing a two toned cabinet design is another option. Most people prefer the navy cabinets for the lower set, while having a white, or off white tone, for the upper cabinets. 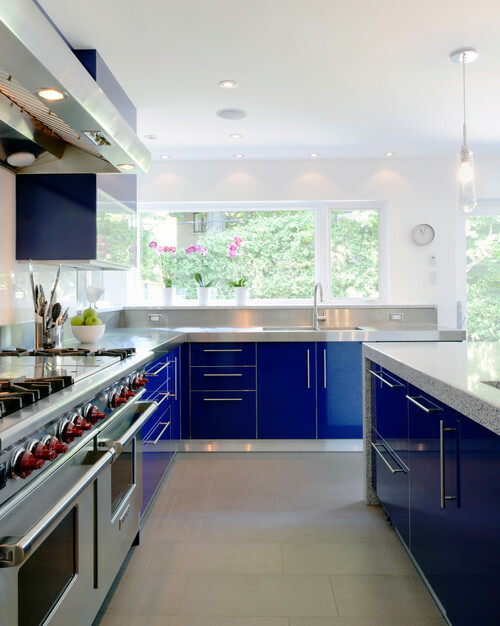 Even contemporary cabinet designs have added blue to their color scheme. While these aren’t quite the same Naval Blue from above, they certainly fall into that navy cabinet category. 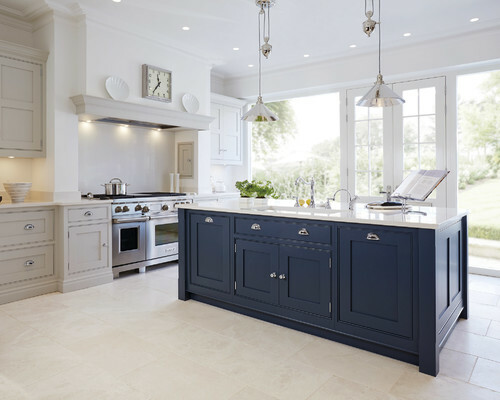 If however, you are one of those people that prefers to not follow a trend that may or may not last as long as you would like, there are still some ways to get that navy blue look without risking the chance of having outdated cabinets in the future. 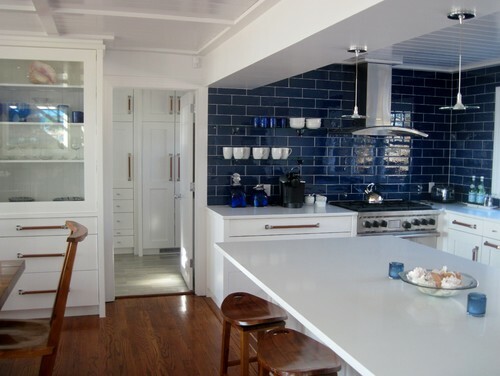 A great way is to do a navy backsplash. It is much easier to change the look of a kitchen by redoing the backsplash tiles than it is to replace cabinetry. Personally, I recommend to anyone wishing to have both a trendy kitchen, and a timeless one, to go with a classic cabinetry (white shakers are a good choice) and just choose an element that you would be willing to change again in 5-10 years. The backsplash is always a great option. 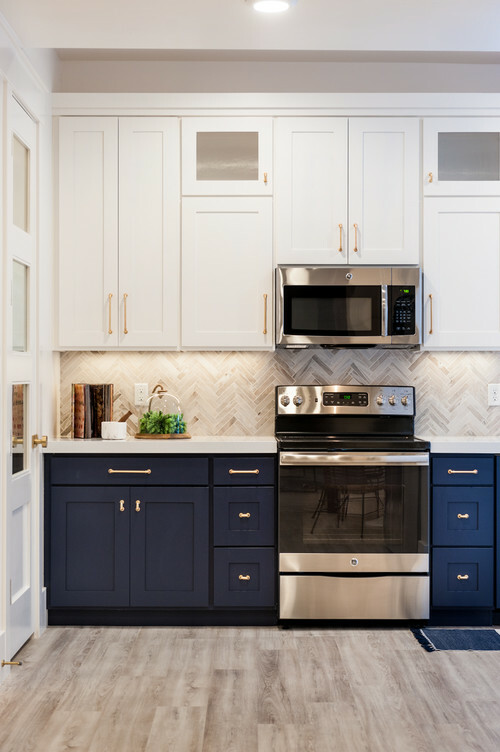 Right now this kitchen looks super trendy and modern with the navy glass tiles, but it could very easily go to a more traditional (think travertine backsplash), or even more contemporary if needed. And all without having to touch the cabinetry. So, if you have been tossing around the idea of navy cabinets or a navy colored kitchen, there are several ways to go about it. It really just depends on how extreme, how budget friendly, or how reversible you wish the design to be. But, don’t be afraid to try this trend if it is to your liking!